You might’ve heard about the three incredible Star Wars experiences you can win: a VIP stay at Skywalker Ranch, a trip to join the cast at the Star Wars: The Last Jedi premiere and a chance to appear in the upcoming Han Solo movie. We’ve been so moved by you Forces for Change, we’re adding another BONUS experience. If you enter this week only, you’ll get the chance to have lunch with Mark Hamill in LA and two tickets to a pre-screening of Star Wars: The Last Jedi! And you’ll still be entered to win those other three experiences, too. Plus, you can get 500 extra entries to win when you use code FOURTH at checkout*! Just click “add promo code” before you finish your payment at omaze.com/StarWars. 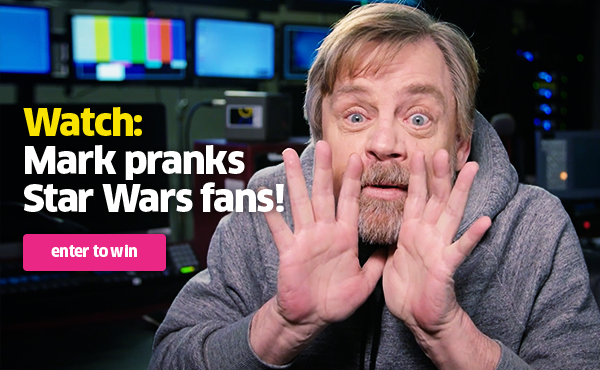 One last thing: Check out this video of Mark pranking Star Wars fans… and stay alert! What if you’re next? Previous article Use the 4th, Jedi: 40% Off Star Wars at CuffLinksDotCom!